Last week we discussed Airbus’ A350-1000 dilemma. The -1000 will be a fine airplane, but we concluded the company needs to go forward with a larger capacity “A350-1100” to match the size of the Boeing 777-9X, but take the Boeing 787-10 approach and be content with sacrificing range in lieu of designing a new wing and engines. Airbus’ A350 dilemma doesn’t end there. What’s it to do with the A350-800? One fleet planner told us a year or more ago that the “-800 is an expensive A330-300” with the same operating costs as the larger capacity A350-900. Airbus has been encouraging customers to move up to the larger A350-900, with Hawaiian Airlines and US Airways the key hold outs. Conventional wisdom says US Airways will swap its order once the merger with American Airlines goes through (which is looking more and more likely, given settlement talks with the Department of Justice). American has a large order for the Boeing 787-9, making the -800 unnecessary in a combined carrier fleet plan. There are now around 80 -800s in Airbus’ backlog, and even officials at Airbus have been ambiguous about green-lighting production of the -800, which is supposed to enter service in 2016 (after the -900 but before the -1000). We have written several posts in which we concluded the -800 would be re-sequenced to 2018, after the 2017 EIS of the -1000. We believe there is a very good chance the A350-800 will be dropped in favor of proceeding with an A350-1100. So what’s Airbus to do in the 250-300 seat space now occupied by the -800 and the aging A330 family? Supply chain demands: Earlier this week, we talked about the prospect of production wars as Airbus and Boeing ramp up over the next five years, combined with the new entrants and the new offerings from Bombardier and Embraer. We noted that this will mean opportunity and risk for the supply chain. Ryan Murphy from Salem Partners has a long analysis the starts with the finishing sector but which goes beyond this to discuss the broader implications. It makes for an interesting read. 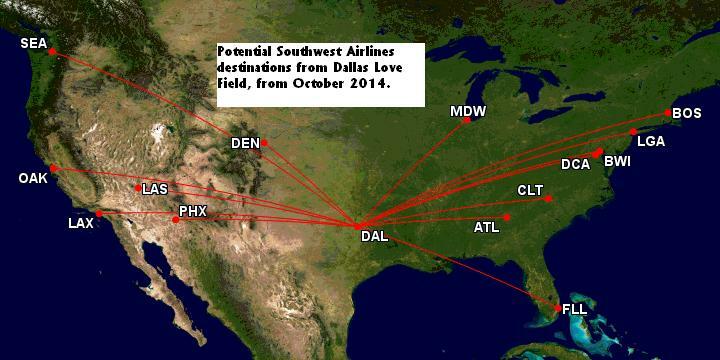 Southwest: Hints of things to come? Yesterday we wrote about Southwest Airlines and the demise of the Wright Amendment that restricts travel from Dallas Love Field. We suggested several routes that Southwest would launch from Love once the Amendment passes into history. Here’s a display Southwest erected on its countdown to the end of the Wright Amendment. We think it hints at things to come. Going clockwise: Chicago, New York and Charlotte seem to be where the airplanes are going. Then Los Angeles and Salt Lake City seem to be implied destinations. But the last one? Boise, or some other obscure city? Or are we reading too much into the placement of these airplanes? Retrospective: We were looking at previous posts for some specific information and in the process re-read one about replacing the Airbus A320 and Boeing 737. The post dates from 2009. In light of subsequent events, it makes for interesting re-reading. We discuss the internal views of Airbus and Boeing about replacement or re-engining their aircraft and the engines from Pratt & Whitney and GE Aviation/CFM. We also touch on Boeing leaning toward not replacing the 777. Retrospective, Part 2: Airchive has a nice set of historical looks at the development of the Boeing factory at Everett: Part One and Part Two. A380 Sales: Orders for the Airbus A380 have been dismal, but Tom Enders, CEO of Airbus parent EADS, sees a turn-around in sales. With the forthcoming Boeing 777-9X, which at 400 seats is considerably smaller than the 525-seat A380, Airbus sees the need to undertake Performance Improvement Packages (PIPs) to improve the economics of the A380. Tim Clark, President of Emirates Airlines and the largest customer by for the A380, has publicly said he wants to see the A380’s engine makers (Engine Alliance in his case) incorporate newer technology from the GEnx and the 777X’s GE9X and Pratt & Whitney’s GTF into the GP7200. The GP7200 is a JV of GE and Pratt & Whitney. Airbus is also offering an 11-abreast coach seating in the A380, which would add 40 more seats and lower the cost per available seat mile (CASM) accordingly. The A380 has proved more economical than Airbus expected, but needs a large load factor of at least 75% (393 passengers at the 525 seat configuration) to be profitably, Enders said. In today’s environment, this is achievable but it also demonstrates the risk inherent to Very Large Aircraft (VLA). According to our airline sourcing that has analyzed the airplanes, smaller aircraft, such as the 777X, Airbus A350-1000 and Boeing 787-10 have similar seat mile economics but lower plane-mile costs without the capacity risk. One airline tells us that “if you can fill the A380 and 747-8,” the airplanes have their place. The four-engine VLAs also are better in the hot-and-hgih environment for engine-out and field performance. But clearly these high capacity and hot-and-high markets are limited. Enders also commented on the progress of the A350 flight test program. This story has detail. A350 Flight Testing: The second Airbus A350 flight test vehicle has joined the test program. CSeries Factory: Airchive has a long look at the program in building the new factory for the Bombardier CSeries. An Asiana Airlines Boeing 777 crash-landed at San Francisco Airport Saturday, killing at least two. This is the first fatal crash involving a 777. Investigators will certainly look at whether fuel line icing may be a factor, which was traced to be the cause of the only other 777 accident, British Airways at London several years ago, also a crash-landing situation. Early news reports seem to reflect a similarity in the flight profile between the two flights. As readers know, we’re traveling and we don’t have access to our files to determine if Asiana uses Rolls-Royce engines, which are those used on BA and which were susceptible to icing. GE engines on the 777-300ER have more recently come under some scrutiny for issues, and we’d expect investigators to consider whether there is any connection if Asiana uses GE on its 777-200s. This would be a natural course of considering all possible factors. Other factors that will be looked at: human error, mechanical problems and controlled flight into terrain (CFIT). Update, 5pm GMT: With the knowledge now that the engines are PW, fuel icing as a cause seems pretty unlikely, but CVR and FDR readouts will indicate engine performance parameters. Although weather doesn’t appear to be a factor, it will be evaluated for the prospect of any clear air windshear or other conditions that could be a contributing cause. Statements by the airline officials at this point that there wasn’t any pilot error or mechanical issues are entirely premature, given when the statements were made the data recorders hadn’t been recovered much less read. Closely looking at a photo seems to indicate the aft pressure bulkhead in place, meaning the tail severed aft it it.